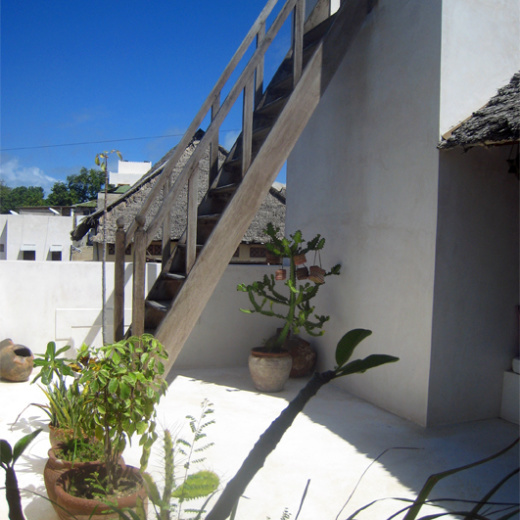 Situated in a particularly peaceful and unspoilt area of Lamu’s historic Stone Town, Maridhiya House has been comprehensively renovated with great skill, care and attention to detail. The result is a beautiful, comfortable and very ‘livable’ house, and one which retains its many historic Swahili decorative features and authentic atmosphere. Maridhiya is entered from a traditional daka entrance porch which leads into a small internal courtyard with palm tree. The impressive ground floor reception gallery and kitchen have 13ft (4 metre) high ceilings and a wealth of meticulously restored decorative plasterwork and ornate zidaka wall niches. The large and airy first floor living and dining area also features high ceilings, traditional Islamic masharabya window screens from Egypt, a generous dining table and expansive built-in baraza sofas. Also on the first floor is a double bedroom with four poster bed, en-suite bathroom, ceiling fan and generous wardrobe & cupboard space. The second floor master bedroom is approached from a breezy roof terrace, part open and part makuti-thatched and with comfortable and shady baraza seats and tables. From here, and from the third floor open-air terrace above, there are attractive and uninterrupted views across neighbouring gardens and rooftops to the Lamu channel and Manda island. The spacious master bedroom runs the entire width of the house and features a king size four poster bed, ceiling fan, ample wardrobe & storage space and a large en-suite bathroom. On the ground floor there is an additional sizeable bedroom with single four-poster bed and adjoining shower room – best used as an ‘overflow’ room for children or unexpected guests. The house is situated close to Lamu’s historic ‘Kinoni’ whetstone - where swords and weapons were sharpened in past centuries – and which gives its name to the surrounding neighbourhood. Also nearby is the charming small ‘Tambuni’ Mosque – named after the many small betel nut plantations which still exist in the area. All Lamu's historic and cultural attractions are close at hand - the seafront, town square, fort, main shopping street, donkey sanctuary and museums are just a few mintues walk away through the quiet streets and alleys of the old town. Maridhiya is ably looked after by Kahindi and Joshua who will do all they can to make your stay as relaxing and enjoyable as possible - their cooking always gets great reviews from guests. 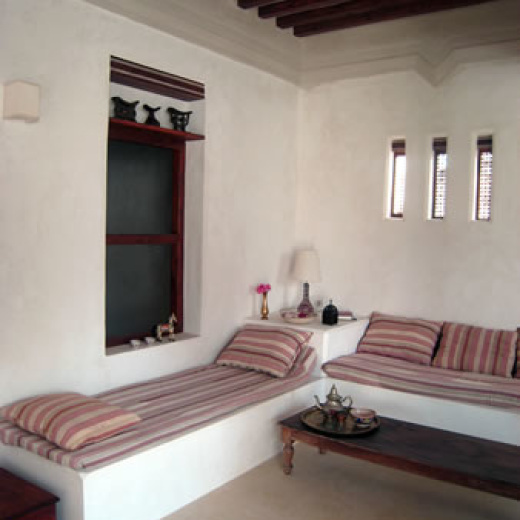 We’re happy to recommend Maridhiya as perhaps the nicest small house to rent in Lamu Town – it is ideal for one or two couples or a small family.